use templates, special filters etc. 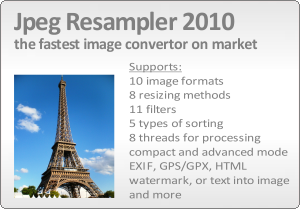 Starting from version 6.3 Jpeg Resampler is the fastest batch convertor of images on the market. Jpeg Resampler is on facebook, please join! Resample photos to smaller size and resolution to share on web, send by email, publish on facebook etc. Generate album of your photos on a web server. Use "Generate HTML" feature, then upload the content of target directory via FTP to the server and it's ready to use. If you like JpegResampler, please donate! or buy a full version. another significant improvement of the speed! program parameters support (used as source for resampling), correction on 12.10.2010, preceed with "/src"
improved logic for automatic detection of "Number of threads"